This HDMI ARC audio extractor is designed to extract the audio signal from any ARC (Audio Return Channel) enabled HDTV displays and convert it to digital S/PDIF audio or line-level analogue stereo signal. 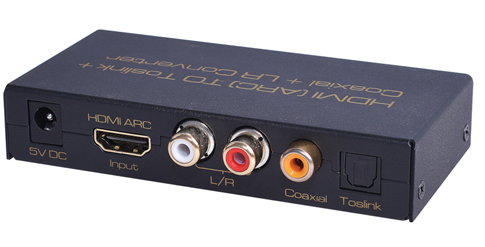 This HDMI ARC audio extractor is perfect for use with those newer HDTV's with no dedicated audio outputs, allowing the connection of an HDTV with HDMI ARC output with those non-HDMI analog amplifiers, AV receivers, headphone or active speakers. [Note]: When using the ARC function, please make sure that the CEC function of the TV Display is enabled and also use the standard HDMI 1.4 cable for the hookup. This ARC audio extractor supports all ARC audio formats including, LPCM, PCM, PCM2.0, Dolby AC3 and DTS. It supports HDMI and digital audio sampling rates up to 192 kHz using the integrated DAC. The ARC channel from the HDMI out of the HDTV set can be converted into both digital audio and analog audio at the same time. Digital S/PDIF audio outputs are available simultaneously coming through both optical output and coaxial S/PDIF output port. Analog stereo audio output is available in RCA L/R format. This HDMI audio extractor provides users with ARC on/off control button and ARC LED indicator light so users can know if the ARC port from TV display is disabled or enabled. This HDMI ARC audio extractor supports CEC emulation, which means that users can control the decoded digital or analog audio output volume simply using the TV remote. Users can hear simultaneous audio outputs from both the TV speakers and the A/V receiver, amplifier or loud speaker pair. Extracts the ARC audio output from HDTV and converts it into digital S/PDIF audio output and line level analog stereo output at the same time for hookup with non-HDMI amplifier, AVR, or active speakers. Featured with ARC on/off button and ARC LED indicator light so users can know if the ARC port from TV display is disabled or enabled. Great add-on device for old AV Receiver equipment to support ARC input from newer TV displays. Maximum digital audio output sample rate up to 192 kHz. Supports all ARC audio formats including, PCM, PCM2.0, Dolby AC3 and DTS. Simultaneous audio outputs from the TV speakers and the digital/analog audio outputs from the ARC audio extractor. CEC emulation allows control of AV source equipment from the TV remote. Plug and play with no configuration required.